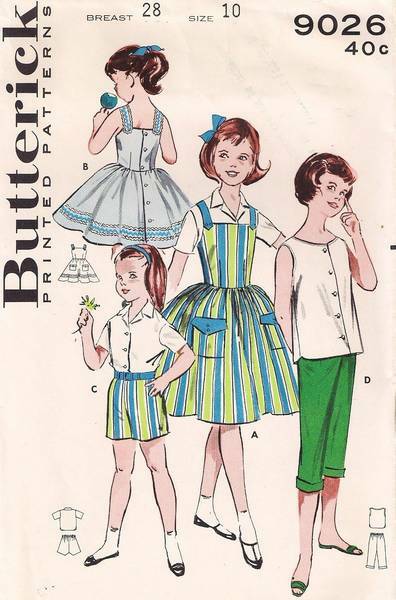 Original mid fifties sewing pattern for girls casual, breezy summer separates includes jumper, dress, shirts, shorts and pedal pusher pants. Jumper and dress both have back buttons from neckline to hem and full gathered skirt. Patch pockets with shaped flaps are optional on the skirt front. Front button shirt in bateau neckline, sleeveless version and notched collar, short sleeve version. Pedal pushers and shorts have elastic at waist. Girls Size 10, Breast 28, Waist 24, Hip 30. Envelope is in good condition.